Complete the final food lab - Veggie stir fry with tofu and brown rice. I have enjoyed having you this nine weeks! 1. What is the current USDA issued food guide and dietary guidelines? 2. What are the 6 essential nutrients? 3. What is a food label and how can you read and understand a food label/ingredients lists? 1. How to be safe and sanitary in the kitchen? 2. What are the basic kitchen tools? 3. How to follow a recipe? 1. How do you measure, cut, mix and cook in preparing food? 2. How do you plan and prepare meals? 3. How do you work with a team and prepare food in a foods lab? Complete job duties/reflection handout and turn in for grade. NOTE: the recipes and amounts are not the same. You need to watch the videos to understand the process. What is not finished in class is to be completed for homework! ​What is not finished in class is to be completed for homework! Head on down the road to food safety.. see attached. Why wash our hands in food prep? Here is why! Complete the meal planning activity. See attached. Wrap up the salt lab. ​3.What is a food label and how can you read and understand a food label/ingredients lists? Watched video on problems with too much salt in your diet. Read the attached packet - "Sodium Research" using RUNNERS reading strategy see attached. Be ready to be a food scientist tomorrow! both sides of the handout. Measure out the correct amount of grams of sugar for the 12 samples. Match up the sugar sample to the 11 beverages and 1 snack provided. Completed Lab Report turned in for grade. ​What is on the back of a box or bag of food? Do you know? Complete the webquest. Read the following to complete the webquest. How do food labels help us to make good nutritional choices? This activity is designed to help you make better choices when it comes to selecting food. There are two websites below that will help you answer the questions from your worksheet. Follow the link attached below to each website and answer the questions based off of the information you've read and watched on the websites. The third part to the web quest worksheet is to evaluate the two food labels below and explain which food item you think is the better choice. Have your Web quest worksheet and pencil ready to begin. Click this link to kidshealth.org website, read the three sections about about food labels. After reading, watch the 4 minutes video and answer the questions pertaining to the video. It is okay to stop or pause the video when the answers are given. Click this link to kidshealth.org website, read the 1st two sections about "Go, Slow, Whoa Foods". Answer the 4 questions about "go, slow and whoa" foods. You've just arrived home from school and you are so hungry. Your mom tells you that there are snacks in the pantry that you can choose from but don't eat too much so you don't ruin your dinner. You a bag of potato chips and a bag of pretzels. 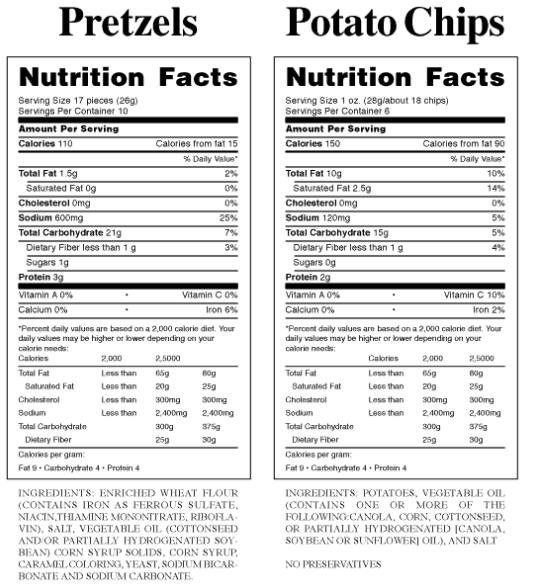 Compare the nutritional labels for these two products and analyze which snack is a better choice. Write in complete sentences on question # 5 to justify your answer. Use the information we've discussed about the importance of different nutrients found in foods and nutrient related health concerns to support your answer. TURN IN YOUR HANDOUT WHEN YOU ARE FINISHED. If and when you are completely done and you've turned in your worksheet then you may go to the nutrition related games below. 1. warm up - what did you eat yesterday? 3. Finish and turn in My Plate Project. Pretend you are a registered dietitian who has been asked to educate others about the 6 essential nutrients. Research and learn more about the 6 essential nutrients and create a tri-fold brochure or power point. Homework - have class overview signed by parent/guardian and returned for homework grade. 4) Complete the Teen Wellness Assessment- Teen Compass. Be sure to add up your score on each page. 5) Complete the Wellness Wheel (please use a pencil/color pencil to shade in the wheel) with your results. 6) After you complete the Wellness Assessment, analyze your results and make a plan to balance your wellness wheel. 3. Complete the webquest. See attached download file. *set 3 goals to get healthier with your nutrition and exercise this 9 weeks.